If people don't want to dress up in an actual costume for Halloween, most still want to get into the spirit, whether it's through animal ears or a Halloween-esque piece of clothing (ex: a skull t-shirt). One of the ways that I have also seen people get into the spirit of Halloween is dying their hair crazy, atypical colors! Growing up, my mom never allowed me to dye my hair, and now that I'm older, I realize that I don't want to damage my dark hair by bleaching it just so that it can retain the color. The only other time that I have attempted to color my hair was my freshman year of college when my friends tried using chalk on my hair. 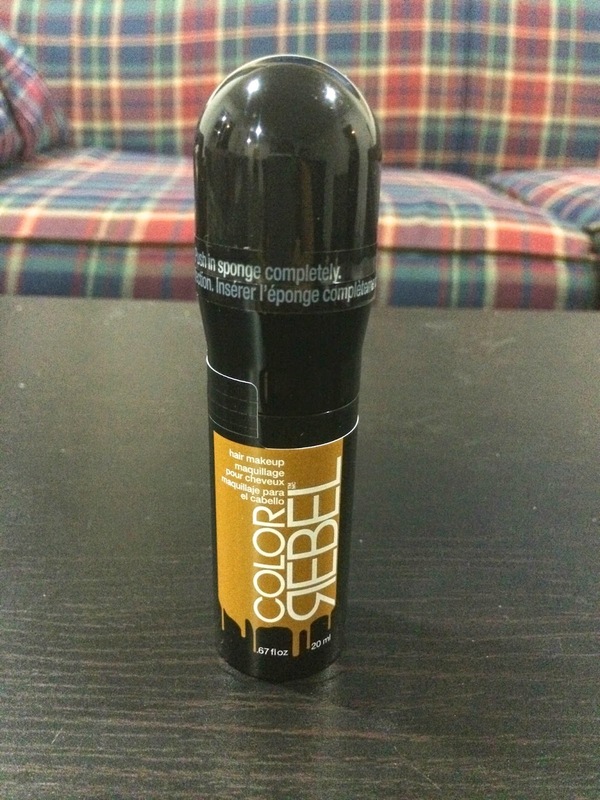 It worked on my light-haired friends, but the color did not stay on me. 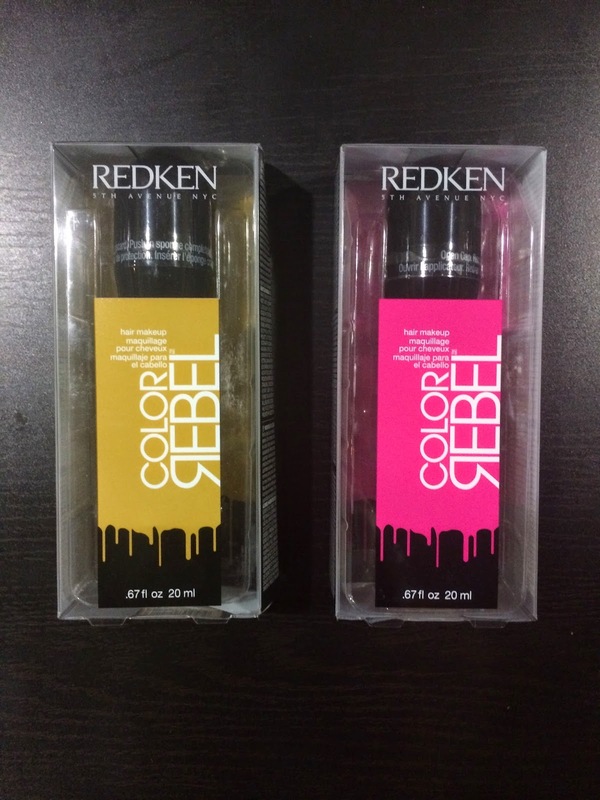 When Redken sent me two out of five of their Color Rebel hair dyes to try out, I was a little nervous but very excited. I was nervous that the color wouldn't stay in my hair, but I was also excited at the possibility that it could stay in my hair. I received two bottles of color to try: Punked up Pink and Gilty as Charged (gold). I was eager to try out the dyes for myself since this would be my first time dying my hair, and I thought it would be so awesome to do crazy colors for this. 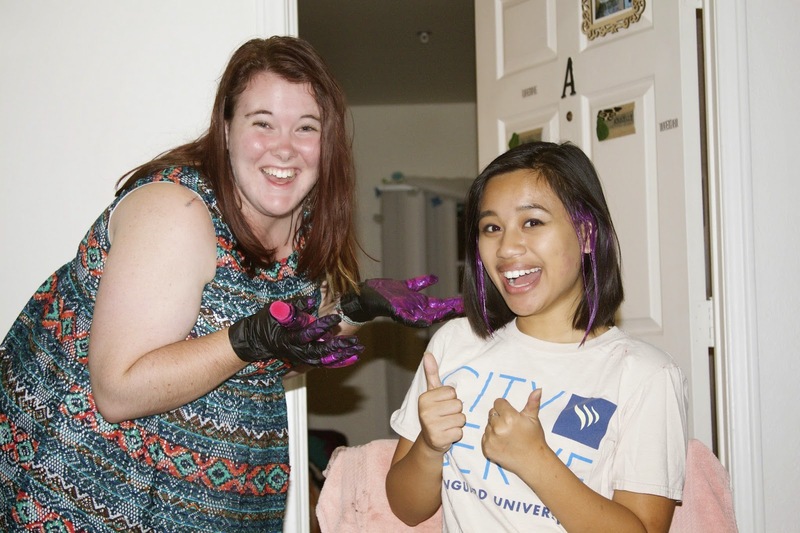 The dyes were pretty easy to use--my friend Stephanie helped out since she was more familiar with hair dye than I was. The biggest thing about the hair dye was using the sponge applicator to apply the dye like makeup onto your hair. You set the dye by brushing and air drying or blow drying your hair. If you want the color to stay even longer, you can curl your hair after your hair is completely dry like I did after using the pink dye. 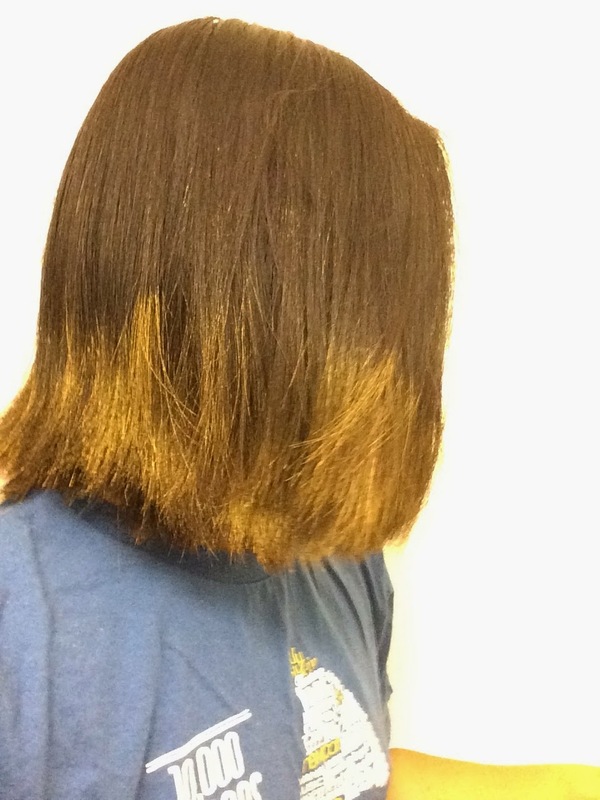 For the gold dye, I was able to do a temporary ombré without bleaching or committing to keeping it that way for a long period of time. I don't have many pictures with the gold dye, but here's how it looked when I first did it! These dyes are supposed to wash out after 2 shampoos, but the dyes have stayed in my hair well over 2-3 weeks' worth of shampooing (I wash my hair every other day). 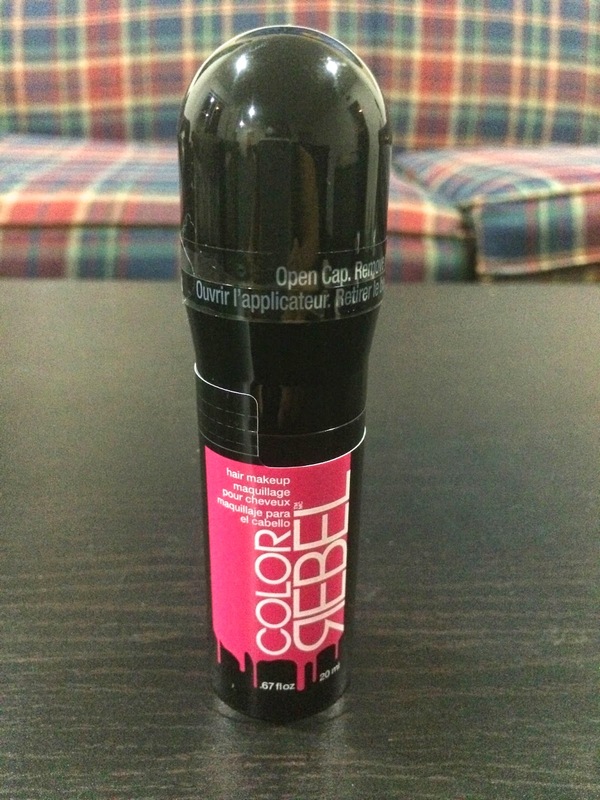 The verdict: I actually really LOVE these Redken Color Rebel dyes. They've lasted pretty long in my hair, considering my hair is so dark and I haven't had to bleach it for the color to stay. But also because my hair is so dark, when it came to the hot pink hair dye, it came out purple in my hair (see first photo at the top of this post). I actually preferred that because I'm not a huge fan of hot pink. My only negative comment I have to say about these are that they make it impossible to completely detangle my hair because the dye is so thick and makes my hair look a little dead. Other than that, I love these so much and want to always color my hair because of them! I'm a changed woman. What crazy colors have you dyed your hair? 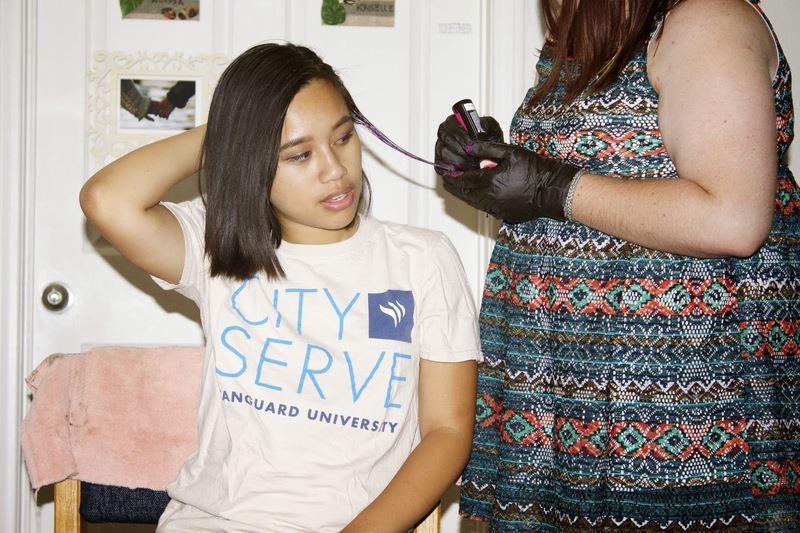 Do you have dark hair and struggle with coloring your hair too? Disclosure: This post is sponsored by Redken and Brandbacker. All opinions are my own. Those are some really neat colors. I love playing with my hair color and do so frequently. My hair looks terrible if I don't dye it though so that's why. This is why I only dye my hair twice a year. It gives my natural hair plenty of time to recover. I know your struggle, Sarah! They are so much fun, I think these are available at salons that carry Redken products!